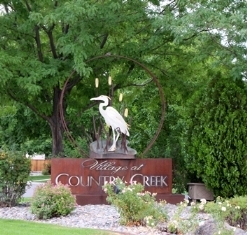 Welcome to Village at Country Creek, the finest retirement community in the Grand Valley, Colorado! A carefree lifestyle for active residents fifty five and better awaits you in this warm and friendly neighborhood. Choose from one of eight uniquely designed patio homes and make Mesa County, Colorado your home. Look no further than Village at Country Creek for a comfortable and relaxing community in which to enjoy your retirement. A well planned neighborhood, comfortable patio homes, yard maintenance, a carefree lifestyle, nearby amenities and a friendly, relaxed atmosphere await you here. Begin a better life at Village at Country Creek, the Western Slope of Colorado’s Premier Retirement Community. Nestled in the charming community of Fruita, Colorado, the village is a mere 10 minutes from Grand Junction, Colorado, giving residents easy access to amenities such as shopping, health care providers, restaurants and entertainment. A stop for the Grand Valley transit is approximately 1/2 mile from the village entrance providing you with easy access to downtown Fruita, Colorado and the entire Grand Junction metropolitan area.